The DOW Index is slowly returning to the Green Zone. Indices like QQQ (Nasdaq 100) XLK (Tech Fund) and FDN (Internet Fund) need to make New Highs soon for the Markets to remain healthy. Please be patient and WAIT over-sold opportunities! Crude Oil was down again today at $67.30. NIHD NII HOLDINGS Medium Term Buy today. Place Sell Stop below the Red Line of $4.42 on the Close. CGC CANOPY GROWTH will not be bought today in the Long Term Portfolio, until it Closes Above the Red Line around $27.43. Emotions are very high now, so please do not Buy unless you are VERY NIMBLE. The Leaders are still Way Above the Green Lines (all Investments eventually return to their Green Lines). EXIT FOXA 21st CENTURY FOX if it is going to Close below your Buy Price, or $45.38. EXIT NTAP NETWORK APPLIANCE if it is going to Close below the Pink Line around $81.06. This trade was not logged. Don’t Buy if the Investment has already popped up too much. 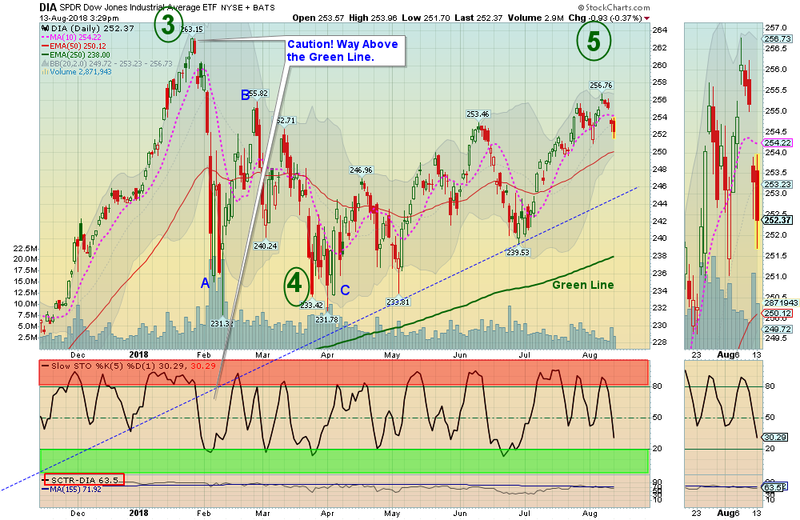 Money Wave Buys are usually good for a 3-6 % move in a few days. We will “Not Log” trades if the Reward/Risk is not at least 2:1. How do you determine when to buy a stock for short-term, and when to buy it for medium term? If the Chart looks like it will take more than 3 weeks for the Investment to re-test the recent Highs, then it will be Medium Term (3 weeks to 3 months).